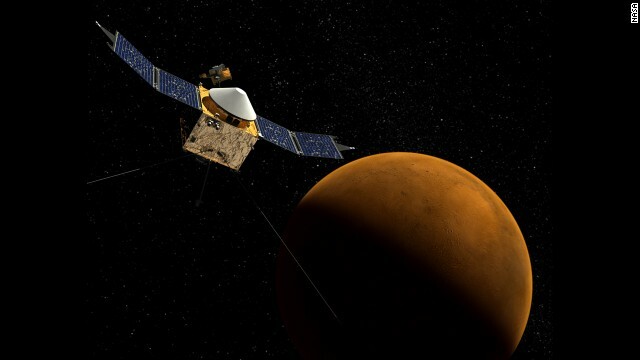 NASA's MAVEN spacecraft arrives at Mars to study the Red Planet's drastic climate change. International tensions take to the U.N. General Assembly stage, a NASA spacecraft arrives at Mars, and a loved one begs ISIS to spare a hostage's life. It's Monday, and here are the "5 things to know for your New Day." A diabolical plan: For months, maybe years, Eric Matthew Frein planned and plotted before he ambushed Pennsylvania state troopers, police say. He has a chip on his shoulder about law officers and allegedly killed one and wounded another. The survivalist with a reputation as marksman has so far eluded officers, as they comb the woods for his trail. They think they are closing in on him but say that his meticulous plans included his retreat. What’s your beef? Starting today, the world's nations meet up for the annual U.N. General Assembly and, as usual, we can expect squabbling at open mics all week. The U.S. and Europe will have a bone to pick with Russia over Ukraine. There will probably be many verbal slaps over the perpetual bloodshed in Syria. And speaking of perpetual, there's the Palestinian-Israeli issue. Recent battles between those two are sure to set the microphones on fire. Never again, hopefully: The Secret Service is pumping up security after Omar Gonzalez allegedly barged over the north fence and into the White House last week. He’s got PTSD, says his former stepson. Otherwise, he’s a “great guy,” a “hero” proud that he served. But the war left him very jumpy. Apparently, Gonzalez said he was rushing to tell President Obama that the atmosphere is collapsing. He was carrying a knife in his pocket when he tried to deliver the message, an affidavit says. “Peaceful, selfless man”: Once again, ISIS is threatening a Western hostage with a gruesome death, and once more, a loved one is pleading for his life. Barbara Henning doesn’t see what sense it makes for the world to watch someone like her husband, Alan, dying - he's a “peaceful, selfless man.” Her words ring true: The English taxi driver was delivering food and water into Syria to help people left destitute by the war there when gunmen nabbed him on the day after Christmas. Climate change worst case: Scientists say Mars, the desolate desert planet, was once a lusher place, where water abounded and the atmosphere was more similar to Earth’s. It’s all gone, and NASA would like to know why. So, it sent the Mars MAVEN spacecraft to sleuth for clues in the planet's atmosphere from its orbit - it won’t be landing on the surface. The craft arrived late yesterday after a 10-month trek across 442 million miles. That’s even longer than MAVEN’s full name: Mars Atmosphere and Volatile Evolution craft. Let’s hope Mars’ climate change is no sign of things yet to come on Earth. Those are your five biggies for the day. Here are a few others that are brewing and have the Internet buzzing. - Super Mario fa' real: Super Mario may have been the world's first free runner. Now, real-life urban hoppers set up a parcours taken pretty much from the run-jump-flip-bounce video game. - No, mama! Woof! No kid wants to put an end to a swimming outing to go home, not even a canine one. Listen to doggy whine! - Laughing all the way to the bank: Verbal acuity plus the luck of the draw made for an overnight millionaire last week. For the third time ever, a player won $1,000,000 at the Wheel of Fortune. - Dangerous games: Virtual reality gets too real for this guy trying out Oculus Rift for the first time. Stare; don't stare: This dog wants to watch its owner eat but doesn't want to get caught doing it. Bella the German shepherd sure has her owner wrapped around her paws!!!!!!!! Swim time's over when Bella barks swim time's over!!!!!!!! What a beauty!!!!!!! !